Cllr. John Dolan, Cathaoirleach, Westmeath County Council is pictured with family members, wife Una, daughter, Aoife and sons Shane and Cathal. 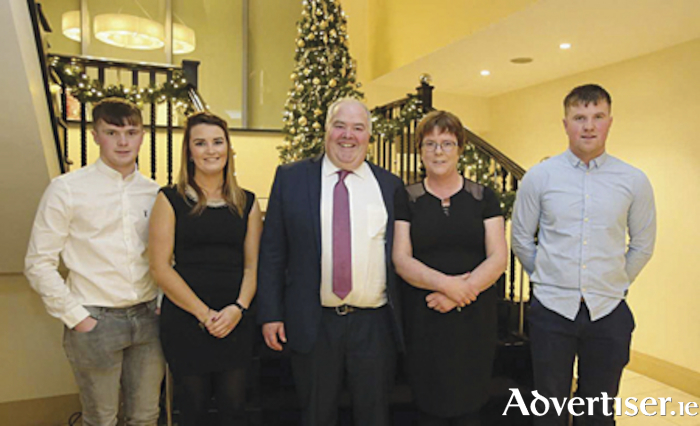 The Shamrock Lodge Hotel was the venue for the annual Christmas dinner hosted by the Cathaoirleach of Westmeath County Council, Cllr. John Dolan. Family members, friends and fellow elected representatives joined the affable local politician to acknowledge his work as part of the local authority collective since taking on the chain of office during the summer.